Has your 5 to 12 year old just asked for a guitar? 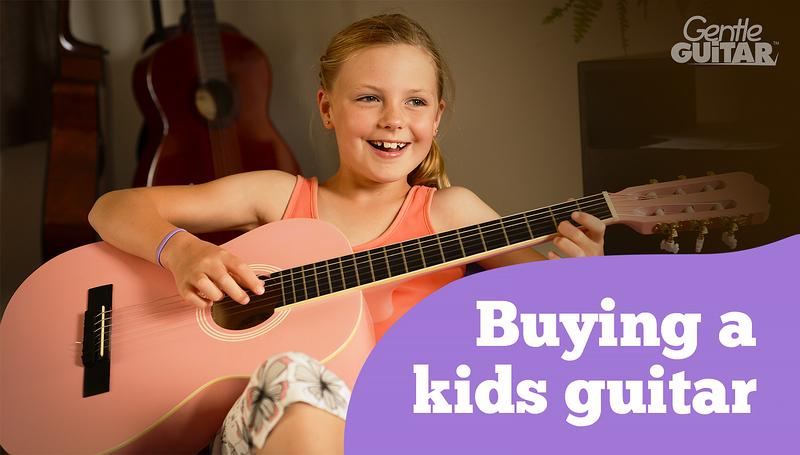 Wondering which guitar to buy for your child? Music retailers are not always as helpful or reliable as you’d expect when advising customers about guitars for kids. Why? Most of the staff are not experienced guitar teachers, and have very little knowledge about teaching guitar to kids. Their job is to sell guitars. Whatever is in stock is often the “right” guitar for your child. Music shop sales staff are usually very knowledgeable in general. But when it comes to buying a guitar for a 6 year old, the advice isn’t always reliable, even when well-meant. For reliable advice about which type and size of guitar to buy for your 8 year old (or younger) child, ask an experienced guitar teacher. A guitar teacher who works with children everyday will have the experience to instantly recommend the right instrument for your child. Don’t have a guitar teacher yet? Also read How to choose the right guitar teacher for your child. The two guitar types suitable for a young beginner are a Classical Nylon String Guitar or an Electric Guitar. The Jazz Guitar is not typically manufactured in child sizes. The Acoustic Steel String Guitar is difficult to play for beginners. The steel strings are hard to press down. They cut into untrained fingertips and are frustrating and painful for children to learn on. The choice for young beginners comes down to classical or electric. The choice depends upon your child’s age and your teacher’s method of teaching. If you are buying a guitar for a 5 to 8 year old, choose the classical guitar. The electric, even child sized, is too heavy for this age group. The classical guitar is lighter and comes in 4 sizes so you can get just the right fit. 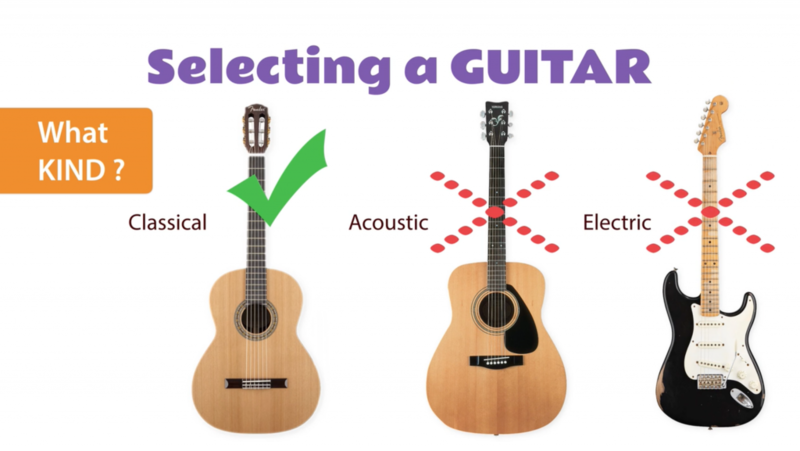 If you are buying a guitar for a 9 year old (or older), choose from either classical or electric. Both come in kid sizes. The electric guitar is heavier to hold than the classical, but it can be more fun to play with an amp and an effects pedal! Older kids have a lot of fun with the electric guitar. Some children, prefer to learn on the classical guitar because it’s lighter to hold. After the age of 9 your child can have a lot of say in the matter. The best thing to do is to go to a music shop near you and have your child try child sized classical and child size electric guitars. The electric guitars are more expensive than the classical ones, take that into account before taking your child to the music shop! At the Gentle Guitar™ school for kids we work with classical guitars for children aged 5 through 12. It’s a traditional guitar and the lightness and hourglass body shape of the classical guitar is ideal for our program which incorporates modern and traditional (classical) playing techniques. Your teacher will advise you which guitar type is recommended for his/her method and teaching style. To conclude, choose a classical guitar for a child under 9 years old. After the age of 9, either a child sized classical or a child sized electric guitar are ideal to learn on. 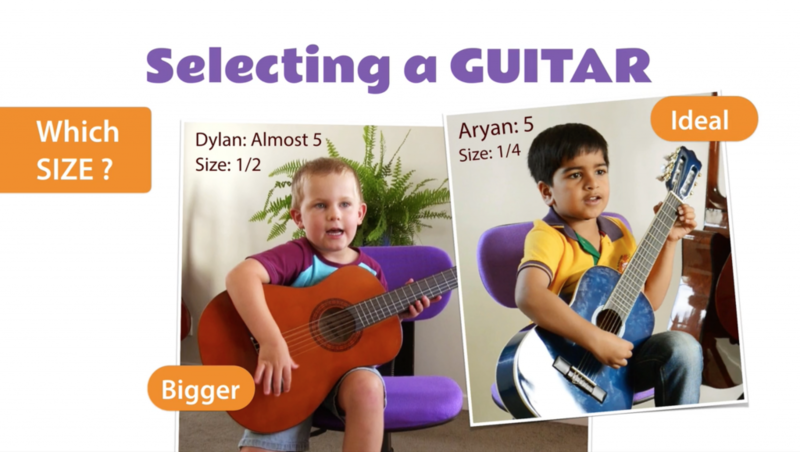 Which guitar size to get for a child? The classical guitar comes in 3 student sizes: 1/4, 1/2 and 3/4. The adult sizes also vary from adult full size to adult 3/4 (a.k.a concert size). Guitar for an 11 to 12+ — adult full size, adult 3/4 concert size, or 3/4 child size (for a petite child). Some 10 to 12 year olds are comfortable with a full size adult classical. A petite 14 or 16 year old would be more comfortable with a 3/4 classical kid size or a 3/4 classical adult (concert size). Sizes are individual and the best thing you can do is ask your teacher and also try a size up and down to see which looks best and feels most comfortable. Make sure you don’t get a guitar that’s too small! Many parents make that mistake and then it’s just as uncomfortable as a guitar that’s too big. Getting it RIGHT will make a HUGE difference to your young player. The ideal person to advise you on the right guitar size is your guitar teacher. He or she knows which guitar size and type will work best for your child and be suited to the teaching method. Many guitar teachers offer a free trial lesson. You can meet with a teacher before you buy the guitar. You can even book a lesson right now with one of our specialist teachers for free! Many parents shop for a guitar as a birthday or Christmas present. In this case you might not yet have found the right guitar teacher. If you’re buying a guitar as a surprise gift, then make sure that you can exchange it. If your child starts taking guitar lessons, the teacher might tell you the guitar doesn’t fit right. At that point it’s often too late to exchange it. If you are not ready to book a free trial lesson on Skype, but you still want to be extra sure that you are buying the right guitar size, then email us! 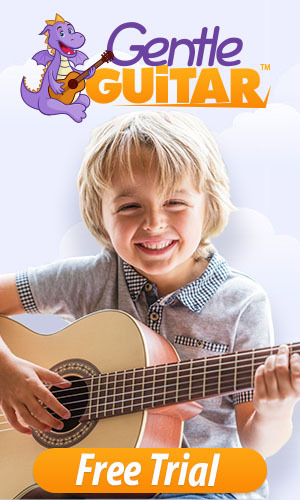 Here at Gentle Guitar™ online school for kids we teach guitar via Skype to kids all over the world. We help parents pick out the right guitar size long-distance via email. If you’d like free advice on which classical guitar size to get for your child, all you have to do is email your info to: ingahope@gmail.com. A photo of your child sitting down and holding the guitar in playing position. After we get your info and photo, we’ll get right back to you confirming if you have found the right size, or if you need to move a size up or down. We do this for all of our students, so you can be sure you will get accurate expert advice via email for free! It’s very important that children get a positive experience learning to play the guitar. Your child’s musical success and enjoyment starts with the right instrument. I did not know that one should take note of the age of the child and the size of the guitar to be able to purchase the right kind of guitar. I find it interesting that there are three student sizes for guitars (1/4, 1/2, and 3/4) to choose from aside from the types. If I were to buy a guitar, I would find it at a certified retailer. Not only will they be able to explain each kind of guitar there is but also be able to help me narrow down to the guitar that I want. We teach guitar to kids from all over the world. In my experience most retailers are not trained guitar teachers. Furthermore, the people who work there have very little experience teaching kids. While they do know a lot about guitars in general, they often recommend the wrong guitar kind or size to our students. This is the reason that we advise that you speak with an experienced teacher first. Music shop staff are great at recommending instruments to adults, but not always to kids. This is something to keep in mind, because they usually sound very knowledgeable. But in practice too many young students were showing up to our lessons with the wrong size or type of guitar. Which is why now we offer a free service where parents can send us a picture of their child trying a guitar at a retail store. Once we see the picture, we can almost always tell you with accuracy whether that’s the correct size for the child. My baby is 6 years old. I want o gift her a guitar on her coming birthday. She loves to play guitar. She is now playing her dad’s guitar. She has started playing the old Gibson guitar after installing new strings and guitar neck screws. But I want to give her a new one as she is performing good. But the thing is, I have never bought a guitar for kids. Found your tips very helpful. Thanks.